On your way to do some cardio? Need a mid-afternoon “pick-me-up”? 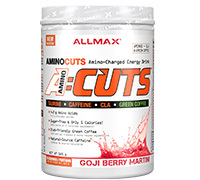 AminoCuts is designed to fit your life and your diet and is available in 2 mouth-watering flavors! With ALLMAX® products, you know what you’re getting. We don’t hide behind proprietary blends. Every ingredient is individually listed with a precise mg measurement. The Clean Label Protocol holds us to a higher standard. You can be sure you are getting the highest quality. A:CUTS provides you with energy to burn! 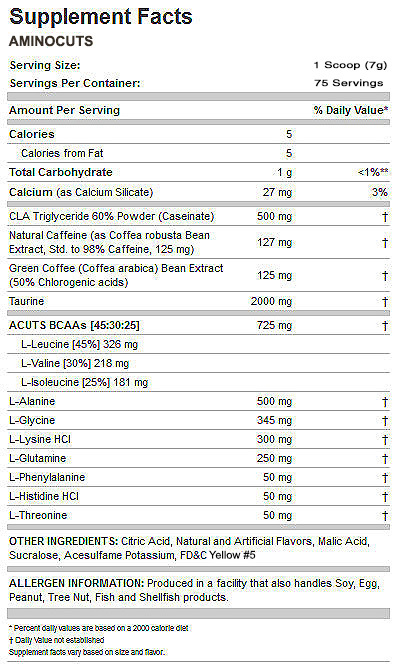 Fortified with Natural-Source Caffeine, Green Coffee extract and CLA, A:CUTS will supercharge your workout with the added benefit of focused fat loss. What’s even better is the addition of 2000mg of Taurine, a non-essential amino acid, and one of the most abundant amino acids in the body that can be found in the central nervous system, white blood cells, the brain and skeletal muscles. Taurine aids in the metabolization of fat, and is also known to improve insulin sensitivity and boost your mood! It can help improve exercise performance and body composition. Taurine acts as a metabolic transmitter and is important for brain metabolism. It stabilizes the heartbeat as it is an inhibitory neurotransmitter, which helps to improve focus during training.